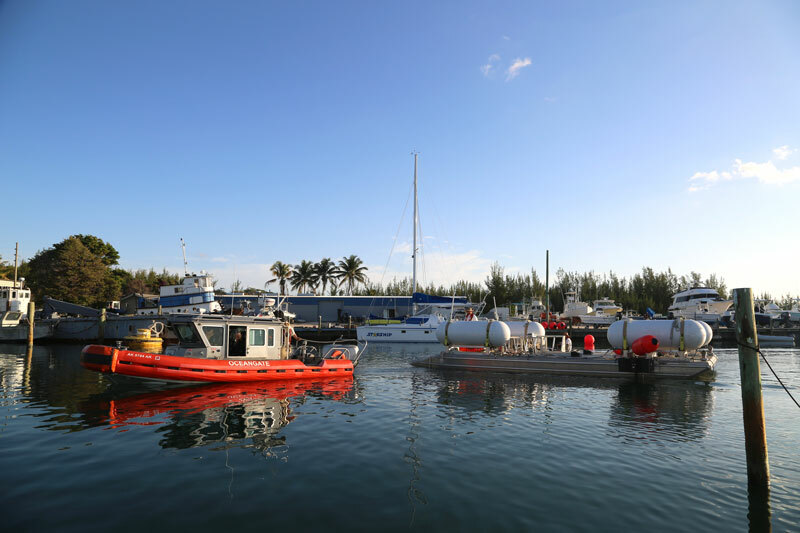 Our team is settling into island life, and despite some significant weather challenges during our first week, we are pleased to share that we have mobilized all support vessels as well as Titan’s launch and recovery platform. 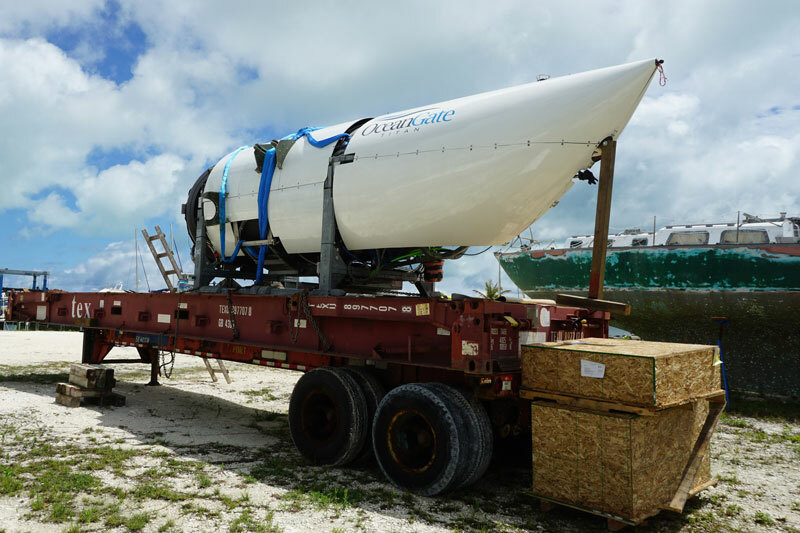 Titan remains on the transport flat rack, due to a series of lightning storms which has delayed the assessment of Titan’s onboard electrical systems after her cross-country journey. Upon arrival on Monday, the operations team confirmed delivery of Titan and all assets and equipment to the Marsh Harbor Boat Yard. As we waited for all assets to clear customs we began familiarizing ourselves with the area and gathering local knowledge to prepare for the first phase of test dives in the shallow water around the island before heading offshore to conduct dives to 4000 meters. All operating equipment was cleared through customs on Tuesday afternoon. With a thunderstorm rolling in, the team made the decision to wait out the storm and begin operations on Wednesday. On Wednesday morning the operations crew headed out at 7:00 AM in the pouring rain to begin the unloading process. They successfully unloaded the launch platform from the flat racks before the lightning began again, forcing us to call off all operations due to hazardous conditions. 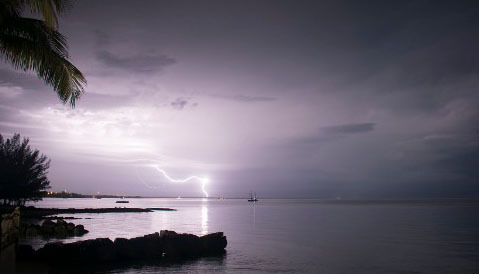 While thunderstorms rolled in and out, we prepared for another early start on Thursday, only to wake up to more thunder and lightning. After a 4-hour delay, the crew began setting up the operations headquarters at the boat yard. They unpacked all the support gear and organized the containers before the next set of thunder storms rolled through. Poor weather forced another late start on Friday, but the team finally caught a break, and with significantly improved weather conditions we were able to launch the support vessels, as well as the launch and recovery platform. During high-tide we took the opportunity to test the launch system as we conducted a series of platform dives within the boat yard marina. After several long, stormy days, we are looking forward to a stretch of sunshine. We spent the afternoon today scouting dive sites and we are anxious to take Titan off the flat rack so that we can install the thrusters and external components and begin our systems checks. Stay tuned for weekly updates from the OceanGate Crew. Titan on flat rack used to transport from the mainland. Titan platform at Marsh Harbour Boat Yard.